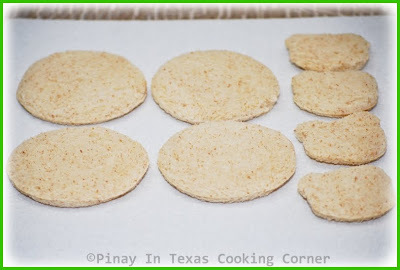 If you are following Pinay in Texas Cooking Corner on Facebook, maybe you already know about our ongoing contest called Recreating PiTCC Recipes In Your Kitchen. It's a dish photo contest wherein PiTCC FB fans who recreates any recipe from Pinay In Texas Cooking Corner can submit a photo of their dish. The photo that gets the most "likes" wins. I haven't announced the prize yet...but I assure you it will be really "great"! This is supposed to be a Christmas giveaway but after seeing some photos from followers who recreated my recipes, I got the idea of just hosting a photo contest. The contest period may seem too long, but with everyone's busy schedule, I guess it's better that way so there will be enough time for interested fans to join. There are 11 entries so far...looking forward to seeing more! Check out Pinay in Texas Cooking Corner on Facebook, and see for yourself which recipes our FB fans recreated in their kitchen! You might get inspired to join too! 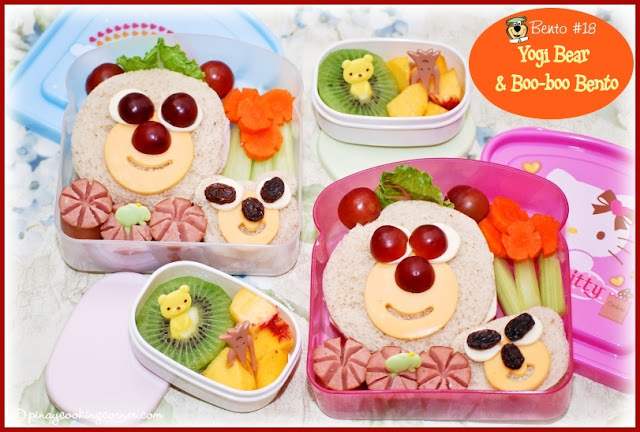 Tuesday night, Cherlin asked me if I can make a Yogi Bear themed bento. I just said "I'll try". 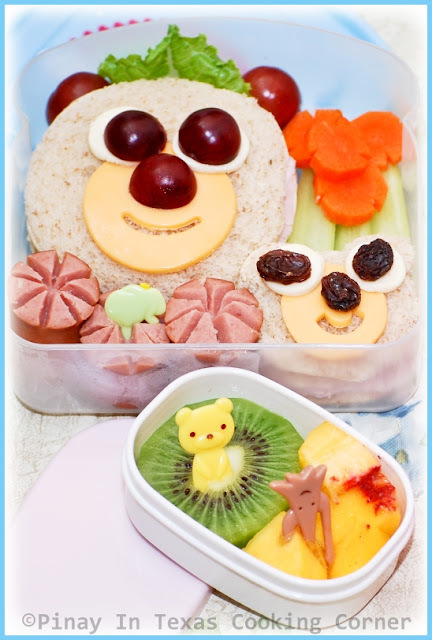 The next morning, I thought an ordinary bear bento would be easier, so that's just what I did. I used a bear face cutter for the small bear, and I used a glass for the big bear. (Sad to admit but I don't have a round cutter. 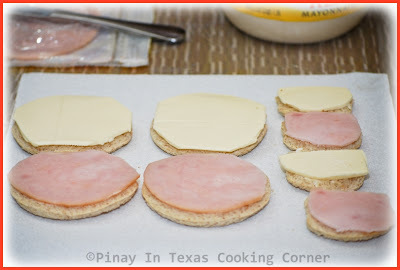 hehe) I filled them with mayo, sweet ham & white American cheese. For the ears, eyes & nose, I used cheese and grapes. For the small bear's eyes, I used raisins. everything is so gorgeous Tina and do give away the gift to the best. I am comfortable with cooking what my hubby enjoys and he surely does not get impressed with all the creativity but a decent meal on the table. What a fun contest! I'll have to check out the entries sent in so far. 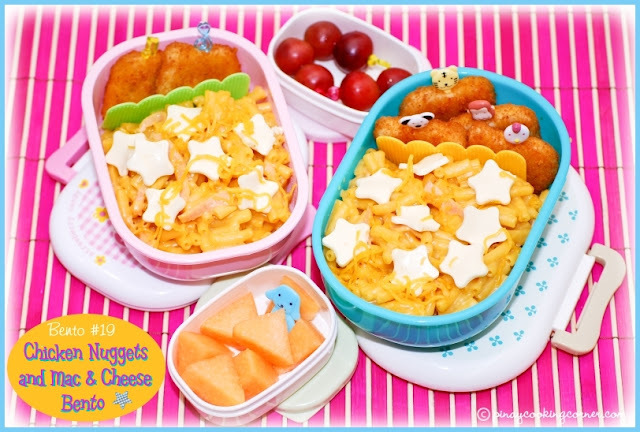 The other kids at school must think you are a super cool mom for making all those lovely bentos. Have a great weekend! To respond to Biren's comment...I want to be a popular mom too! j/k I gotta start learning how to be a cool mom like you! 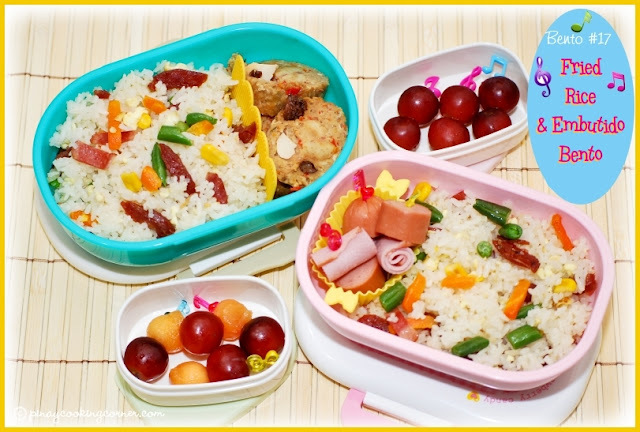 Wonderful bento collections Tina! This looks almost too nice to eat! Such delicate and patience in creating something so beautiful! The contest is a fab idea! I love it!!!! Fun contest! Love the bento boxes- your like the coolest mom ever! Your bento boxes are too cute!! I;m loving your blog! I can't imagine how excited your girls are opening bento box... and their friends probably want you as a mom. LOL! I would!! Thanks for shariing lots of creative ideas to entertain kids with healthy food! This is gorgeous! What a fun contest!